Seriously, once you know about Calcium Side Effects, it will forever change your world view on health in general and begin taking you on a ‘rabbit hole’ of information that you did not know existed. Taking calcium supplements is one of those ‘givens’ that we have been told so often that we take it for granted as being true. However, once you know the truth about calcium supplements side effects, you will forever begin to question everything that the health profession tells you. Is calcium good? ‘Everyone knows’ that calcium builds bones and that people, particularly menopausal women, need more calcium later in life to ward off the inevitable loss of bone that occurs with aging. 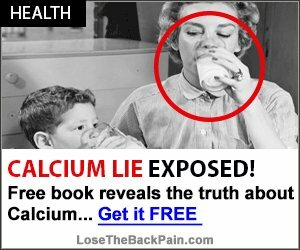 But what if this 'knowledge' is an absolute myth that has no basis in reality, and that taking calcium supplements could possibly be one of the worst health decisions you can make in your life? This doesn’t even include 'everyday' chronic problems that are Signs of Magnesium Deficiency such as: stress, headaches, anxiety, constipation, that are often from a 'relative' Magnesium Depletion that occurs in most people who take calcium supplements. The ‘punch line’ to this is that it doesn’t even reduce the number of fractures! So, taking calcium supplements is not only worthless, but worse than worthless; in fact, many knowledgeable people consider these supplements toxic, and that there is no Best Calcium for Osteoporosis. Unfortunately, taking Osteoporosis Drugs is not a good option either, as they have their own set of downsides. When studies are done, it is always the ‘holy grail’ to find something that ‘reduces all cause mortality’, meaning that the overall death rate decreases when the people in the study do whatever they are studying. Vitamin D, fish oil, calorie restriction, and selenium are some of the few interventions that come close to getting this coveted designation. Unfortunately, calcium is known to to the opposite and INCREASE all-cause mortality! One of the ways in which calcium side effects increase death rates is by increasing heart disease rates (1). The myth of heart disease is that the plaque build-up is cholesterol, but it’s not; it is calcium that gets deposited in the coronary arteries rather than the bones. Excess calcium doesn’t just deposit in the coronary arteries, but can be deposited most anywhere in the body, including the brain. Brain lesions are areas of the brain that are more dense on scans than other parts of the body, and are linked to dementia in the elderly. A recent study showed that the number and size of brain lesions in the elderly are increased in those who take calcium supplements, even if the calcium dose is low (2), and another study showed a higher risk of dementia in women who take calcium(5). In fact, some substances shown to effectively treat Alzheimer's Disease are based on binding excess calcium in the brain(3). Is Calcium Good for Breasts? While a higher risk of breast cancer has not been directly linked to calcium side effects, there is plenty of ‘circumstancial ‘ evidence that they might very well raise the risk of breast cancer. Let me explain. Calcium supplements definitely raise bone density, or at least prevent bone loss. However, higher bone density has not been linked to lower incidence of fractures. Unfortunately, higher bone density HAS been linked to a higher incidence of breast cancer in at least three different studies(4), and this gives us 'circumstantial evidence' to believe that taking calcium supplements could be a risk factor for breast cancer. We know for sure that calcium side effects include higher rates of heart disease and brain lesions and that they MIGHT lead to higher breast cancer rates. 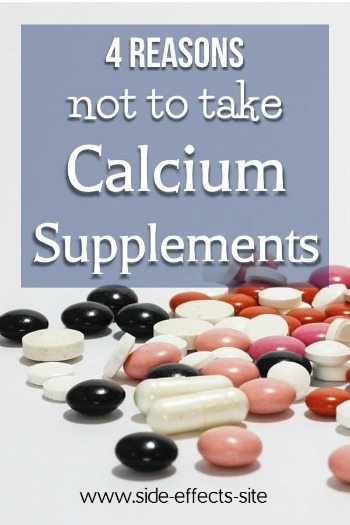 We also know that calcium supplementation does not reduce rates of bone fractures and that Calcium Blood Tests cannot help you determine if the calcium you are taking is too much or not. So, tell me again, is calcium good? If not why you are interested in taking calcium supplements? 2.Elevated brain lesion volumes in older adults who use calcium supplements: a cross-sectional clinical observational study.